The Dailiness, How do you measure your days? 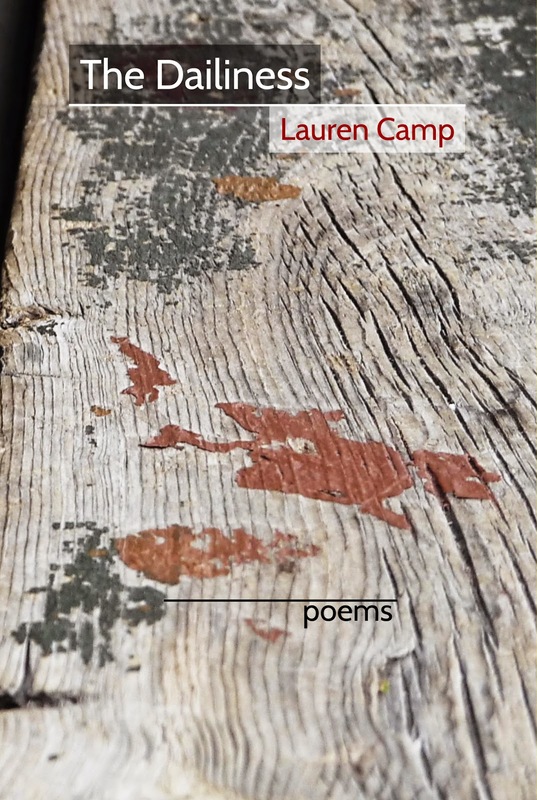 Since moving to Albuquerque in 2012, I’ve noticed that one name, Lauren Camp, keeps coming up in email notices about poetry events—readings and workshops—in the Albuquerque/Santa Fe area. Her readings are captivating. Finally, I took one of her workshops and experienced what all the excitement is about. Lauren is down to earth, energetic, and generous in manner and well versed in literature, art and music. Since that workshop two of Lauren’s poetry books have won awards. The Dailiness, reviewed here won the National Federation of Press Women 2014 Poetry Book Prize and a World Literature Today “Editor’s Pick.” A third manuscript, entitled One Hundred Hungers, was selected by David Wojahn for the Dorset Prize. The book will be published by Tupelo Press in 2016. Lauren is also an award winning artist whose work has been exhibited in solo and group shows as well as other venues around the world. She also hosts Audio Saucepan, a weekly music & literature Public Radio program (http://ksfr.org/programs/audio-saucepan-ksfr). 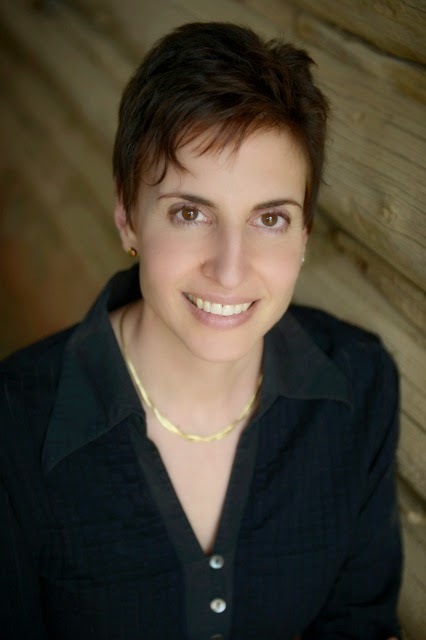 Much more information about Lauren, including voice samples, is available on her web page, http://laurencamp.com/index.shtml. The web page itself is an enjoyable experience full of Lauren’s poems, sounds and images. It is safe to say that Lauren is both a Renaissance woman and a Southwest poetry treasure. The Dailiness contains fifty poems in three sections. The poems are lyrical journeys through days with the familiar and unfamiliar. Themes include nature, sound & music, improvisation, time, direction (especially sideways and back looking), place, medical conditions (insomnia and cancer), and family. In several poems, Camp’s lines give a nod to other poets and writers, including Tillie Olson and Sharon Olds (“Drama Class, 1989”) and Mary Oliver (“To Be Still”). The list of acknowledgements for journals that previously published the poems in The Dailiness fills 1 ½ pages. The language and music of Camp’s poems makes them so enjoyable to read that it takes a moment to realize the tragedy of some of the topics, or the riddle created by some of the imagery. While most of the poems are free verse, there are also a number of form and prose poems. Before looking at some individual poems, I’d like to share some lines/phrases that grabbed me as I read. “I grew/moldy and without promise” (“Unpacked”). “And you will not understand the language/but are willing to be carried backward/into the space before sense//where sound rolls sideways in your mouth”(“And Now You Would”). “Do not get out your knife./My skin knows its angles already” (“Let Me Live in Your Tolerance”). “The way his hyphen flattened the beveled air” (“The uh-huh of Desire”). “In the absolute, every moment can go wrong.”(“Clarity”). “This ground is voracious, but clogged. We do what we can./We are a people of anticipated guilt”(A Colloquy on Water”). “The man who bore/this cross lugged the weight of pardon, mounting it here,/where the shoulder of heat is heaviest”(“Atonement”). “The merciful comfort of data…. Maybe she had no taste for the soup of her children…. [S]he gently read me each drop of the rain” (“How I’d Explain What Kind of Mother She Was”). “We walk…into the waltz and step of the ocean, into waves that become blue apostrophes…. Everyone is angled, held in the ever-shrinking linen and spandex of self”(“A Week in L.A.”). “[S]top the suffering and ask for exactly what you want…./Crouch into the smear of a tulip, the tragic palette of time”(“When”). Next, let’s look at three very different poems. “My Grandfather and His Eggs” is written in irregularly rhymed couplets and lines of irregular length. It is about the speaker’s mother’s father who spent his life candling and sorting eggs before he “headed home to boiled eggs.” “He carried his lungs in a shirt pocket, his humor/in a highball glass…./fried his fears.” This image of a life full of eggs becomes a conceit that crosses generations as the poem moves into first her mother’s reaction to his death, and then the effects of the her mother’s death. My mom was fragile when he died. I tell you grief can lay eggs anywhere. in the bowl of heaven. life in our house keeps breaking open. “What You Might Hear” begins with a quote by Ornette Coleman, an innovative jazz musician in the Free Jazz movement of the 1960s (http://en.wikipedia.org/wiki/Ornette_Coleman). In 2007 his album Sound Grammar won a Pulitzer Prize. The quote reads, “…when I realized I could make mistakes…I decided I was really on to something.” The poem is written in irregularly broken and spaces stanzas, the white space between lines and stanzas like the “silence [that] travels sideways, that …is careless and quirky.” The second stanza warns that “[i]f you/ want answers, you must haul the questions behind you/for a long time until the music starts up, faulty/and brooding.” After several lines describing Coleman’s playing and “[h]is horn, that pliable prophet of conduct,” the poet declares: “If you cannot respond,/he has proven his point, the rate of the measure, his sounds wrenched in error./Where he got them won’t matter.” The first two lines of this last quote are right justified. If he offers you meaning, accept. The theme of mistakes, naiveté, recovery and redemption in the face of mistakes, appears in other poems in this collection, but, by far, this poem is the major celebration of the potential hidden in mistakes. The last poem I’d like to look at is, “The Coming Day,” the penultimate poem in the book. Its fifteen line pattern is 2/1/2/2/1/2/2/1/2. Again, line lengths vary, and the rhymes are imperfect, their pattern irregular. Again, it is the music—the lyrical rhythm and imagery—of the poem that captivates. It begins with the speaker’s dream—as she puts it “My eyes are inside.”—of song and playgrounds. The focus shifts to the “small seed in the (speaker’s) back yard,”/just a murmur now, but in seven years we will be locked in/with something that really happened, a world that germinated/while we loved.” These lines are a great example of the poet’s ability to time travel and take the reader with her. From sleep to a barren but seeded back yard to a world germinated by love. touching particles, sowing atoms of air. In the morning,"
The poem is pregnant with the liminal fecundity of time, place, the natural world, and dimensions of reality. Passions grow everywhere. .... Flickers impregnate the eaves. feel your eyes burn along my face. The last three lines cross the threshold into waking reality, anchored in the ordinary task of eating, but full of promise on the extraordinary table of the bedspread. count the ripe parcels of the coming day. We are grounded in the ordinariness of the day even as we “embedded” (forgive me) in the sensual depths of the images. In summary, The Dailiness, is a stunning collection of evenly intriguing poems that vary as much in content as they do in form and style. Their music and imagery makes them at once easily accessible and endlessly minable. Thank you, Lauren for agreeing to this interview in conjunction with my review of The Dailiness on our Poetry Matters blog. Since you are accomplished in visual and musical venues, as well as poetry and essays, some questions extend beyond this book. That leads me to my first question. Caroline: Would you describe your journey to and as a multi-media artist—visual, musical and writer—and how the different media inform your work, overall and each in the others? Lauren: I came to poetry from art, and to art from magazine writing. I came to music in between, and music informs both the art and poetry. Then, I set art aside because poetry asked me to trust in it, to find it more moments. Poetry writing is filled with what I like about art making: the composition and texture, the negative space, the line. I had very little exposure to art growing up. I created — sure. I always did. But I had no formal direction, and almost no awareness of any of these forms of expression. Poetry lets me color every line and stanza in ways I never dreamed words were meant to be used. I found poetry well into adulthood, and love using it to careen through the visual and sonic possibilities of everything I write. Caroline: As the book’s epigraph signals, Dailiness is a travelogue through time and places: inner and outer, public and private, wave and particle. In fact, the borders we take for granted between these realms become porous in your poems. For instance, in “What You Might Hear,” you write, “If you/want answers, you must haul the questions behind you/for a long time until the music starts up again, faulty/and brooding.” What do you understand about how your mind navigates and often erases conventional borders of association? Lauren: I don’t understand any part of how my mind works. I know that if something feels too easily “captured,” I must start again — randomizing what I am after. I want both rhythm and curiosity in my work. The material of my own curiosity, I mean. I want to let the why and how of what I’m looking at surprise me. I know enough to remember to put in the when and where as grounding. After that, I figure I’m free to fly around. I also want to disrupt rhythm, to throw in some friction. I learned this while making art, and it carries over. Always allow the unexpected, the unplanned, the strange. This is often where the power lies. Caroline: Would you speak about how you arrive at such a nuanced balance of narrative, philosophical reflections, and lyricism in your poems? Lauren: Every one of these elements is critical. Narrative provides the detail, but can be flat by itself. Too much reflection becomes some attempt at capturing the conscious self. I like a dark side, but I want to extend that darkness into an understanding, and maybe, hope. Lyricism — oh, thank god for it. It is what makes the process of crafting a poem such a trial and a treasure. The music isn’t there until I’ve almost completed it. I eye every word with suspicion, and go through a lot of revising, playing with spaces and order, the pitch of sound, the pictures I’m drawing with language. I need the words to be much more than words, to be precise and intense and unusual. I need them to stack together, but be sort of slippery. Caroline: The book includes both titled and untitled poems, in which the first line serves as the entire or partial title. What is your decision making process regarding titles? Lauren: I have titled hundreds, maybe thousands of poems and artworks. I even give each episode of my radio show a new title. I believe fully in the value of a perfect title. It could be soaked in what is coming, could lay out the echo of the poem, or misdirect the reader. For example, the poem “When You Leave, Reiterate the Alarm” had several drafts with another title. At some point in the revising, this phrase showed up as the last line of the poem. In the next draft, I pulled it up to the title, and left it there, knowing that was the strongest opening I could give the poem. Some titles place the reader, as in the poem “At Echo Canyon,” which investigates a phenomenal stone amphitheater in Abiquiu, New Mexico. Perhaps the quickest to title was “Let Me Live in Your Tolerance.” I wrote the poem shortly after hearing the awful news report, and couldn’t find even the ghost of a title in me. That first draft got by with “Title” as its stand-in. I did one revision (unusually paltry for me), and gave it that title. It came to me whole—almost as a sort of wisdom. Caroline: Your poems are full of creative combinations of imagery such as “the enzymes-fixed juice of conclusion (32),” “silence travels sideways (17),” “a furrow of calories (1),” and “The man…lugged the weight of pardon, mounting it here,/where the shoulder of heat is heaviest (34).” Would you describe how you arrive at such unique combinations of imagery? Lauren: I ask my students to look for new ways of describing, to hug unexpected words together to make new concepts. I do this all the time. It requires that I first untether from the normal way to say something, and then “shop” for new ways to approach the subject. I keep a messy desk that drives me nuts, but gives me a whole surface of wild possibilities. I just have to look around, blurring the actual into chance happenings. Caroline: What poets most inform your writing? Lauren: Many, many, many. Because of my work with Santa Fe Public Radio, I am exposed to a tremendous amount of what is currently being published. My goal every week for my radio show, “Audio Saucepan,” is to find magical or powerful poems that will itch at a listener’s ear. The show interweaves global music and contemporary poetry. I want to select poems each week that offer a way of looking, a truth that is also surprising. I have stacks of books, and read a lot, often just dipping in. Other times, I find a delicious hour to sit with one or two books, and form a friendship. In this way, I discover a lot of poets, styles, even words. Reading so many books for all these years, I appreciate all the different prisms that writers use to build a sensuous presence. Certain poems, poets and styles fill me with jealousy (why didn’t I write that?). I know what I like, and I learn easily from these poems. Those that are odder or discomfiting to me, well… I trust them to tell me what I can’t get away with in my writing, or to pull me into their lair so that someday I might claim that approach. More than anything, after holding all these books and turning their beautiful pages, I am filled with a sense of community. The writers… how extraordinary we are, caring to point to certain places and times, to a certain emotion! Caroline: Would you talk about your teaching and how you attempt to impart some of what you know about writing to your students? Lauren: I approach teaching with a sense that it is important to share magnanimously whatever I have learned. I work mainly with older adults who wish to write about their life experiences. They don’t care too much about technique at first; they simply love their stories. They need a gentle guide to help them craft their simpler forms into something more fulfilling. As a child and growing student, I didn’t have any real support for either my artistic or literary impulses. Every week in my classes, I give what I wish I had been given— direction, encouragement, approval. I think of my role as cheerleading for humans who have something to say, and introducing them to the possible techniques and approaches to say it better. I prod them to shape their stories, and encourage them to let the language ripple in front of them. That’s good, fun work. Caroline: Anything else you’d like to say about your work as artist, writer, musicologist? Lauren: I love all three of these disciplines, and adore even more when they cooperate to make something new. Thank you, Caroline, for shining a light on my work. Caroline: Thank you, Lauren, for your time, poetry, art and love of music.